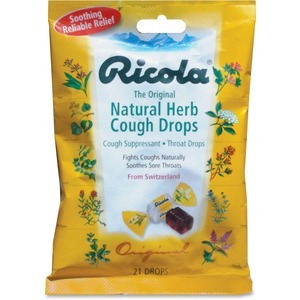 Enjoy high-quality ingredients with these cough drops that are made from exclusive Swiss mountain herbs. Lozenges bring a unique, delicious taste and soothe the mouth and throat to reduce irritation. Ingredients are created using natural farming methods without chemical pesticides to ensure optimum taste and effectiveness. Lozenges are perfect for battling the uncomfortable symptoms of cough due to a cold or inhaled irritants as well as minor irritation and pain due to sore throat or sore mouth.